Every woman is on the hunt for a killer, fool-proof beauty regimen as we roll into summer. For healthy skin that glows, Organic India's Turmeric supplement is a little known beauty secret that can work wonders. One of the most popular spices and supplements in India for radiant skin, Turmeric is an herbal tonic known to support important blood and liver functions, and to be an abundant source of healthful antioxidants. Organic India's Turmeric formula is made with the purest, 100 percent organic Turmeric, a natural spice that contains curcuminoids, which are phytonutrients with powerful antioxidant properties that fight the damaging effects of free radicals in the body. Fortified with curcuminoid extract and organic ginger, Turmeric supports important blood and liver functions, healthy joints and overall well-being, which is ultimately reflected in a radiant, supple skin. At $20 per bottle, Turmeric supplements are an affordable addition to the ultimate beauty regimen that will leave you feeling confident from the inside out. 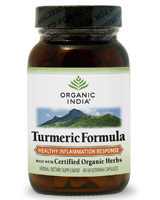 My Experience: I received a sample of Organic India's Turmeric formula to review. After taking these supplements for about two weeks now, I have noticed an increased radiance to my skin. I feel healthier, and more energetic. 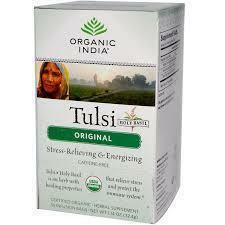 I also received a sample of Organic India Original Tulsi Tea to review. Throughout India, Tulsi is considered "The Queen of Herbs" and is revered as a sacred plant infused with healing power. Traditionally grown in an earthen pot in every family home or garden, Tulsi (also known as Holy Basil) makes a delicious and refreshing tea that possesses wonderful health benefits that support the body's natural immune system while relieving the body's negative reaction to stress.Tulsi's remarkable life-enhancing qualities, noted repeatedly in ancient Indian scriptures dating back 5,000 years, are now here for you to fully enjoy. My Experience: This tea is very mild tasting and it helps me unwind at the end of a stressful day. I really enjoy its soothing properties. It makes me feel warm inside and ready for a good night's sleep.